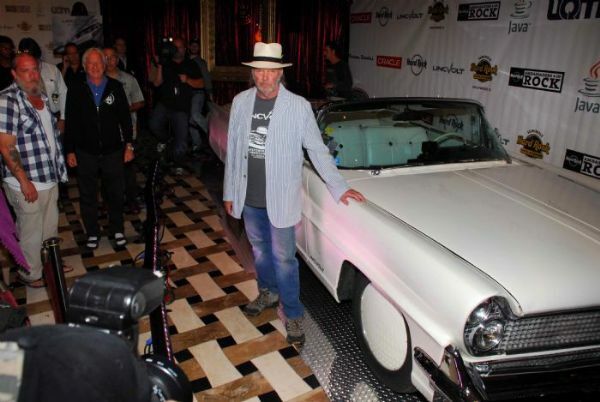 Here's some news on Lincvolt -- Neil Young's car designed to re-power the American Dream. Lincvolt will feature the world's best sounding audio system, PureTone. Taking full advantage of Cloud based libraries of recordings by your favorite artists, Lincvolt will simply sound like no other car on earth. Lincvolt passengers will enjoy PureTone "Studio Quality Sound," the actual sound heard by the artists and producers when they created the original recordings, making Lincvolt audio sound superior in quality and digital resolution to any music ever heard in a car. In other LV news, a film on the making of Lincvolt is in production. More adventures of Lincvolt on the Under The Hood blog. Get behind that wheel! Thanks k! as long as it works thru tha PA speaker in the back window of my 1970 Delta 88 I'm in! I thought it might be a good idea to include local independent music stores in the network with Pure Tone. I could bring my PONO into the store for a download. This would keep the money flow local and encourage local artists to sign up and use Pure Tone as well. There are two stores in my area that sell vinyl and this could give them a boost by having exclusive rights to distribute Pure Tone in areas where there is already an interest in hearing music as it was intended to be heard.Any promotional material associated with the music could also be available at such venues.